If you go to Bay Days this holiday weekend to partake of the carnival food and rides, be sure to stop by the Bay Skate and Bike Park Foundation booth. 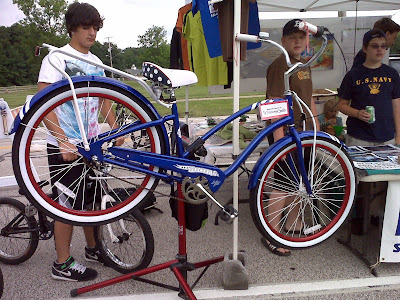 They are selling raffle tickets now through Saturday to win this Electra Navy cruiser donated by Century Cycles. The proceeds go to BSBP, which is trying to move heaven and earth and local politics to create a place for west side kids to enjoy their skateboards and bicycles. Or: Save yourself 3,000 elephant-ear calories and a stomachache from the Roundup by just donating to BSBP here. 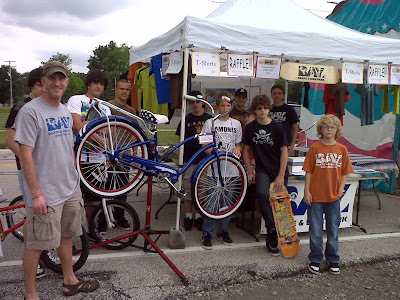 It's a tax-deductible act of civic altruism to add to your July 4th festivities, plus founder and BSBP grand poobah Lawrence Kuh (below left) and his crew of skate and bike kids will really appreciate the help.